When Steve Jobs strode onstage and unveiled the iPad in January 2010, he should have ended his presentation by firing a starting pistol. The news left nearly every other big computer and consumer-electronics maker racing to get into the tablet market that Jobs' iPad had suddenly created. As it happens, the competition turned out to be a marathon. More than a year later, we're still talking about tablets that are huffing and puffing their way toward the showroom floor. There's RIM's BlackBerry PlayBook, slated to arrive by the end of March. HP's Web OS-based TouchPad is due this summer. And dozens of other models are on their way. The pace has been so plodding that Apple's second-generation iPad  which the company is set to announce next week  will apparently beat most other companies' first-generation models to market. 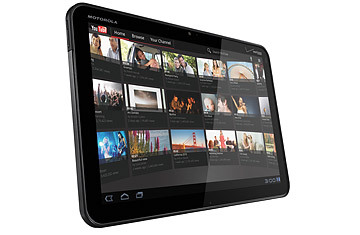 Then there's Motorola's Xoom, which goes on sale at Verizon retail locations on Thursday. (I've been testing a pre-release unit provided by Motorola and Verizon for the past few days.) It's the first honest-to-goodness, no-qualifications-necessary iPad rival from a major manufacturer to hit stores. That's in large part because it's also the first to pack Android 3.0 Honeycomb, the operating system that Google designed specifically with tablets in mind. The Xoom has its fair share of raw edges, but it's a great leap beyond earlier Android-based tablets like Samsung's Galaxy Tab, which took the unsatisfying shortcut of using earlier versions of Android that were meant for smart phones. Unlike the current iPad, the Xoom will also be a 4G wireless device, thanks to Verizon's zippy LTE network  but not until the second quarter of this year, according to Motorola. For now, it comes with 3G and the promise of a free upgrade. That's one of several telltale signs that it was rushed out the door. Adobe's Flash Player software, which will let Xoom owners get at Flash Web videos and games that don't work on the iPad, won't be ready for a few weeks. And there's a dormant slot for MicroSD memory cards that Motorola plans to enable in an upcoming software update. The display measures 10.1-in. diagonally, giving it a skosh more elbow room (and more pixels) than the iPad's 9.7-in. screen. When you meet a Xoom in person, though, the most striking difference is aspect ratio, not size. Apple's tablet has a 4:3 display that's reminiscent of a book or magazine; Motorola's has a 16:10 widescreen that makes it look more like a miniature HDTV. Of course, wider isn't always better: The iPad's less exaggerated dimensions are superior for reading e-books and other text-centric tasks. But in landscape orientation, the Xoom's extra space makes for comfier typing on the on-screen keyboard. It's also well-proportioned for HD movies. For more on the Xoom, check out this post at Technologizer.